Like other manufacturers with in-house talent in machine design and their own machine shops, the Armory sometimes built a machine "from scratch" or used elements of an old machine to make an entirely different one. In almost every case, the designers worked with available or newly-introduced technology, combining known forms and adding incremental innovations to meet the special needs of particular operations. Industries which break down their manufacturing processes into minute subdivisions and make heavy use of special-purpose equipment are most likely to generate a large number of incremental innovations. One interesting example in the 1916 Armory was an "old Ames profiler ...built over" as a single-sided broach for work on the trigger slot of the Model 1903.4This machine played a useful role in the production system, and its manufacture must have been less expensive than the purchase of comparable new equipment. CONSERVATIVE INNOVATORS AND MILITARY SMALL ARMS: AN INDUSTRIAL HISTORY OF THE SPRINGFIELD ARMORY, 1794-1968, Michael S. Raber, Patrick M. Malone, Robert B. Gordon, Carolyn C. Cooper, Raber Associates, 81 Dayton Road • P.0. Box 46, South Glastonbury, CT 06073, (203) 633-9026, August, 1989 [unpublished], p, 270, 272. Proposal of January 10, 1902, and contract with Pratt & Whitney Co., December 21, 1903, RG 156/1382. Introducing new types of machinery could cause disruption of a manufacturing system; unless the potential gain in efficiency was clearly worth the disruption, a manager might decide to replace an old machine with one just like it or add extra machines of a type already in use. For a technical discussion of the similarities between the Krag and the Model 1903 designs, see Stuart Otteson, The Bolt Action, pp.29-42. American Machinist, 1916 and 1917; Colvin, 60 Years, pp. 183-187. 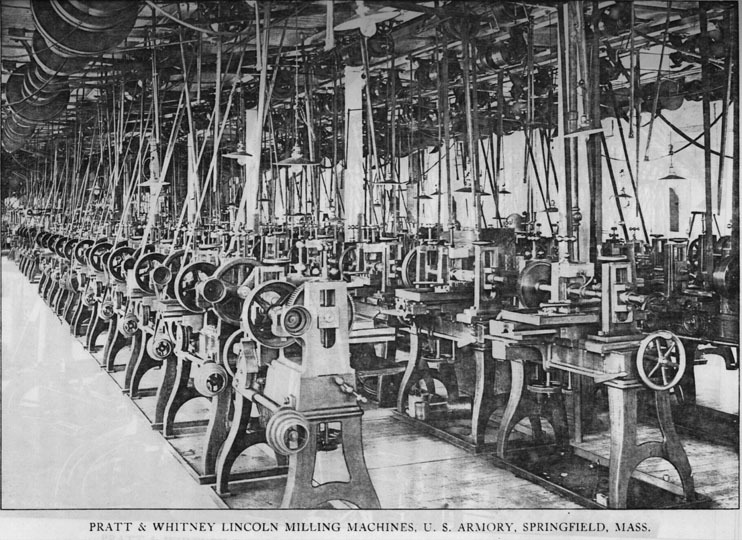 Colvin was primarily responsible for the analysis of metal-working processes on the Springfield, while Viall wrote the sections on the making of its wooden parts. Arthur Ormay produced the detailed drawings: there are 2337 figures, only a few of which are photographs. The entire study, with complementary materials as addenda, has been reprinted as Manufacture of the Model 1903 Springfield, Wolfe Publishing Co., Prescott, Arizona, 1984. Colvin and Viall, pp. 164-165. See also "Manufacture of Krag-II," p. 330, for a description of "an automatic machine designed in the shops, which drills simultaneously from each end" of the receiver.